George C. Edwards, Jr., was born on August 6, 1914, in Dallas, Texas. He graduated from Southern Methodist University with a Bachelor of Arts degree. He received his M.A. from Harvard University and his J.D. from the Detroit College of Law. Edwards had a long career of public service. From 1940 through 1941, he served as director-secretary for the Detroit Housing Commission. His public service shifted to a national scale when Edwards fought in World War II. From 1943 until 1946, he was stationed with the United States Infantry in the Philippines. Edwards’ service on a more local level continued during and after the war. From 1941 until 1949, he served two terms as council president of the Detroit Common Council. In 1951, he was a judge in the Wayne Probate Court, Juvenile Division; in 1954, he served as a judge of the Wayne Circuit Court. 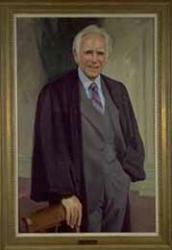 In 1956, Edwards was appointed to the Michigan Supreme Court, and elected to it in 1959. When he was elected he garnered the largest majority of votes ever attained up to that time for a Justice of the Michigan Supreme Court. Edwards relinquished his seat on the Michigan Supreme Court in order to return to Detroit as Police Commissioner. George C. Edwards, Jr., died in 1992.